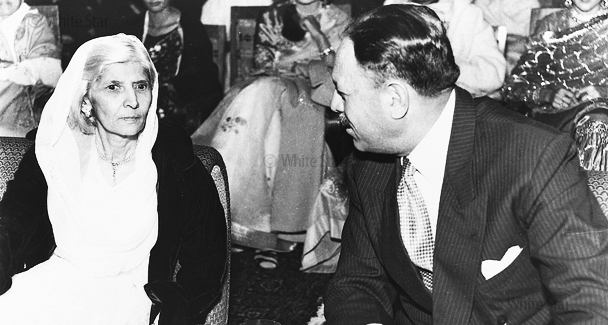 “They call her the Mother of the Nation,” sniffed Pakistan’s President Mohammed Ayub Khan. “Then she should at least behave like a mother.” What upset Ayub was that Fatima Jinnah looked so good in pants. The more she upbraided Ayub, the louder Pakistanis cheered the frail figure in her shalwar (baggy white silk trousers). By last week, with Pakistan’s first presidential election only a fortnight away, opposition to Ayub had reached a pitch unequaled in his six years of autocratic rule. The Big Stick. White-haired Miss Jinnah, 71, the candidate of five ragtag and usually disunited opposition parties, was picked mainly because she was the sister and confidante of the late revered Mohammed Ali Jinnah, father of his nation’s independence. But Pakistan’s response to her razor-tongued attacks on Ayub’s highhanded ways has surprised and shocked the government. Students throughout the nation staged angry protest marches against the regime, and at least one demonstrator was killed by police in Karachi. DOWN WITH THE AYUB DICTATORSHIP, cried posters in the East Pakistan city of Dacca, where students enthusiastically proclaimed Miss Fatima Jinnah Week. In Karachi, Pakistan’s biggest city, student unrest prompted the government to close all the schools indefinitely. Most legal groups in Pakistan have come out for Miss Jinnah, and were denounced by Ayub as “mischiefmongers.” In reply, the Karachi Bar Association overwhelmingly adopted a resolution urging “the party in power to get rid of the notion that wisdom, righteousness and patriotism are the monopoly of their yes men.” The usually complaisant newspaper editors defied the regime’s attempts to make them endorse a restrictive new press law. Running Scared. Actually, Ayub has been a reluctant and benevolent dictator, who has vastly improved the stability of a country that was paralyzed by squabbling politicians before he took over. Considering Pakistan’s backwardness and poverty, the Ayub-designed electoral system is not half bad, giving the vote to 80,000 middle-and upper-class electors. While that is a tiny percentage in a total population of 110 million, most of those millions are not only illiterate but totally ignorant of political issues. With heavy support in rural areas, where many Moslem electors particularly disapprove of a woman’s candidacy and where Ayub’s economic reforms have helped more than in the cities, Ayub is still expected to win the election by some 60% of the vote. Nonetheless, he is running scared, because Candidate Jinnah has managed to focus every form of discontent in the country. To brake her bandwagon, he abruptly decreed that elections would be held Jan. 2, instead of March, as originally scheduled. Explaining lamely that the situation is “a little tense,” the government also rescinded a law specifying that political rallies must be open to the public. At closed meetings with groups of electors, Ayub answered practical questions sensibly enough, but kept lashing out at the opposition with growing anger. Countering Miss Jinnah’s repeated charge that he had been unable to restrain the U.S. from helping Pakistan’s No. 1 adversary, India, he set out to portray her as pro-Indian and pro-American. Ayub’s campaign, in fact, was turning increasingly anti-American. Though U.S. aid (about $5 billion since 1951) is vital to the nation’s wretched economy, a leading member of Ayub’s party cried: “America never was our friend and never could be, because as a nation aligned with the anticolonial movements, we are at cross-purposes with America.” As for Ayub, he plainly regretted ever calling elections in the first place. For after six years of insisting that Pakistanis were not ready for democracy, the campaign had shown that Mohammed Ayub Khan probably isn’t either. …. the Time article is poorly written though. it’s inaccurate (either ayub has been good for pakistan, or it has a wretched economy, both can hardly be right; who expects him to win 60%? what about the view of rural east pak about a female cadidate?) and arrogant (ms jinnah has got a point about a democracy of one or 50, but ayub is right about a democracy of 80,000). Ayub Khan knew that after all, he was running a dictatorship. He therefore had to project that in the absence of his rule, anarchy would prevail. Any wonder that he tried to put down Fatima Jinnah. Ayub Khan is another person who did not genuinely honor Mr Jinnah’s ideals, which is why he did not accept Fatima Jinnah either. Ayub Khans attacks became qite vicious in the latter stage..crucially besides the usual smear campaigns done by the establishment against anyone (RAW- Mossad-CIA agents) who threatened their power..there was also the splitting of the NAP by ZABs using the chinese card against the leftists..the death of Nazimuddin and Suhrwardys absence. Funny, that Ayub was the one who told the then Secretary of State, “Our army can be your army if you want us”. Surprisingly, Indians were backing Ms. Jinnah against Ayub. To be fair to Ayub, though, after the Tashkent declaration, it was the same Fatima Jinnah who accused him of selling out to the Indians, so this discourse does work both ways. I am confused. Did both of them sell out to the Indians? No, when someone sells out he/she becomes an Indian by default. I shall wait on events. Thank you for the clarification, btw. But it doesn’t really answer my question. As a matter of fact, it answers nothing, and is just an elegant quip. Ayub Khan selling out to the Indians is a distinct possibility; there is no other explanation for the pathetic conduct of the war, and the incredible conduct of the peace. But why Ms. Jinnah? Apart from Ayub using the tactics of accusing your opponent of your own crimes, what is there to justify this? The resident liberal sub-divinity is infecting me, I see, and not with liberalism, but with malorthographia. the theme of “selling out to Indians” or being too soft on India is and was used at various times by politicians for domestic political gains. So, for example, during the election campaign Fatima Jinnah was heavily critical of Ayub Khan’s concessions to India regarding the Indus Waters Treaty, and the Tashkent Declaration that he signed with Indian PM Ravi Shastri. To be fair to Ms. Jinnah, almost all political parties except NAP were severely critical of the Tashkent declaration. Ravi was a fine all-rounder but never really rose to such great heights…. Btw, are you Rabiwasti/Eleventyone from chowk? The Indian PM was Lal Bahadur Shastri. Ravi Shastri is a cricketer. haha, sorry. I’ve clearly been watching too much cricket over thanksgiving break. Well… without getting into whether Tashkent was fair or not… ZAB – Ayub’s foreign minister- made Tashkent a political issue. Everyone was opposed to it …. Fatima Jinnah was accused of being pro-Indian because she had enormous support in East Pakistan…. which was to the mind of Ayub Khan and the rest an Indian fifth column. Btw… the overwhelming vote for Fatima Jinnah from the East Pakistanis in 1965 prove Azad’s fabricated interview wrong on that count. Btw… the overwhelming vote for Fatima Jinnah from the East Pakistanis in 1965 proves Azad’s fabricated interview wrong on that count. Is it true that Fatima Jinnah was assasinated by her cook from Rawalpindi who absconded from Karachi after the incident? BB was assassinated in Rawalpindi. Also, there were two attempts on Musharraf’s life while travelling from Rawalpindi to Islamabad, and one on PM Gilani near Rawalpindi..
Let’s get the confusion sorted out. The ’65 war resulted in the Tashkent declaration in early ’66. Shastri suffered a heart attack that same night because he could not get over the enormity of the concession that he had made over surrendering Haji Pir pass back to Ayub. Don’t ask me for the source of this bit. But Fatima and Ayub crossed swords in ’64 so she couldn’t have criticized Ayub for concessions in Tashkent in ’65, concessions that killed Shastri not Ayub. btw, i read a lot of Pakistani opinion on the result of 1965 war, and either they say, it was won by Pakistan or it was stalemate. Then from where this question of selling to India is arises. Rabia is right. Fatima Jinnah died in 1967. The 1965 war appears to have been more or less a stalemate, which some in Pakistan may have chosen to see as a victory, and therefore, possibly the acrimony over Tashkent. Needless to say, India saw the war as an Indian victory. This otherwise fine article was decent enough some of the other things Mr.Khan alluded to during this period. A really vile allegation concerning Ms.Jinnah and her ‘relationship’ with her brother. Not just trousers, but the fact that she was not married and that she lived with her brother all those years …. Its a pity that Pakistan never did manage to bring up good, decent leaders. It was like this than, and it is so now. Leaders are not aliens. They come from within the people. Therefore, if a nation is not producing good leaders, there is no point in blaming the leaders. The people themselves need to see what kind of system they are running. It needs to be conducive to producing good leaders. In other words, a strong democracy. milind kher i see that you have said this in the context of the comment before yours. but even in the context of pakistan, i’m afraid it’s a ridiculous comment to make; BS in case of the dictators, with all due respect. what do you expect a society to do against gun-totting criminals in uniform making mincemeat of the constitution? such usurpers are not aliens. they’re simply criminals of the worst kind. developing a strong democracy needs time. being run over by (the threat of) tanks every decade is hardly the people’s fault. please don’t make excuses for criminals. and kindly don’t try and use their crime to malign a whole people. there is no shared guilt between the criminal and the victim. ever. Bad things happen not because of bad people, but when good people do nothing. Whereas I do understand that it is difficult to fight gun toting criminals, it is not difficult tp rouse public opinion and create pressure. Was not Musharraf compelled to step down? And today, instead of spreading snide text messages against Zardari and working towards his downfall, can people not strengthen his hands?